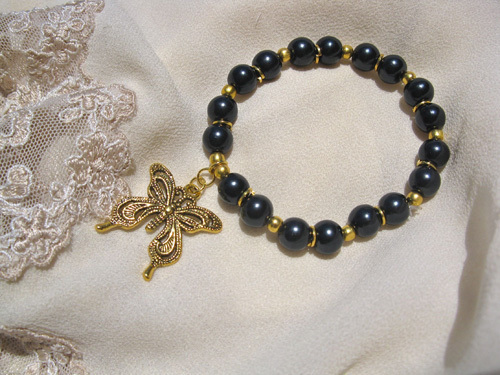 Our sweet little butterfly charm bracelet is made of shiny black beads with little gold coloured ones in between, and features a beautiful golden-coloured filigree butterfly. The butterfly symbolises change and is therefore suitable for someone about to embark on new ventures . . or, it can remind us to make changes when the opportunity arises. The Butterfly calls on us to expand our awareness, spread our wings and move forward with joy - and find our own place in life. Dimensions: The butterfly bracelet is approx 17cm round but is elasticated and therefore suitable for most wrist sizes. This meaningful Painted Lady butterfly charm bracelet is a truly inspirational gift. It comes gift-wrapped, like all our presents (with an information card) - and we can print a personal message on your behalf.